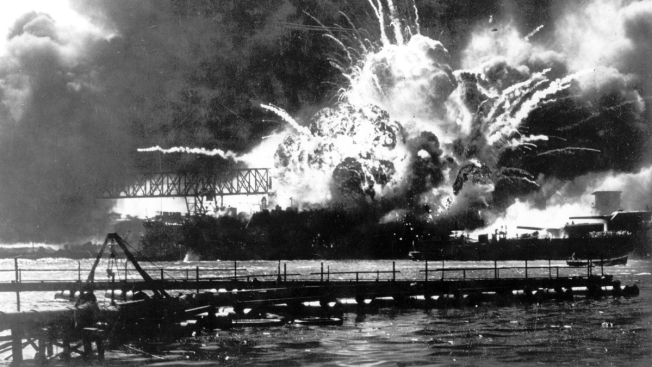 In this Dec. 7, 1941 file photo provided by the U.S. Navy, the destroyer USS Shaw explodes after being hit by bombs during the Japanese attack on Pearl Harbor, Hawaii. About 20 survivors are gathering on Friday, Dec. 7, 2018, at Pearl Harbor to remember thousands of men lost in the Japanese attack 77 years ago. The youngest of the survivors is in his mid-90s. The Navy and National Park Service will jointly host the remembrance ceremony Friday at a grassy site overlooking the water and the USS Arizona Memorial. Retired U.S. Navy Cmdr. Don Long was alone on an anchored military seaplane in the middle of a bay across the island from Pearl Harbor when Japanese warplanes started striking Hawaii on December 7, 1941, watching from afar as the bombs and bullets killed and wounded thousands.